Welcome to MOV r0, and my first blog post. The goal of this article is to teach you how to JTAG the Raspberry Pi 2 without having to compile a custom kernel to enable the GPIOs to do JTAG. Let’s begin! Next we’re going to compile a small binary written by the guys over at SysProgs (Link). This will be done on the Raspberry Pi 2 itself. I’ve modified the original source to change the peripheral base address to support the Raspberry Pi 2. (Working on some server stuff.) The peripheral base went from 0x20000000 to 0x3F000000. NOTE: Before we compile this, we must edit the peripheral base and change it to 0x3F000000. I use nano since it’s my favorite editor. At this point, we’ll need to create a configuration file for OpenOCD to interface with the RPi2. We’ll use the configuration file found from Jitomesky’s GitHub (Link). Finally, we’re ready to connect to the Pi’s JTAG pins. *Note: Pin 1 is optional, but useful for verifying voltage level. Next we’ll fire up OpenOCD and attempt to connect! (You may need to use a different configuration file for your interface depending on which device you are using. FTDI devices are cheap and work very well) Since I have the TUMPA, I am using the TUMPA configuration file in the FTDI devices folder. 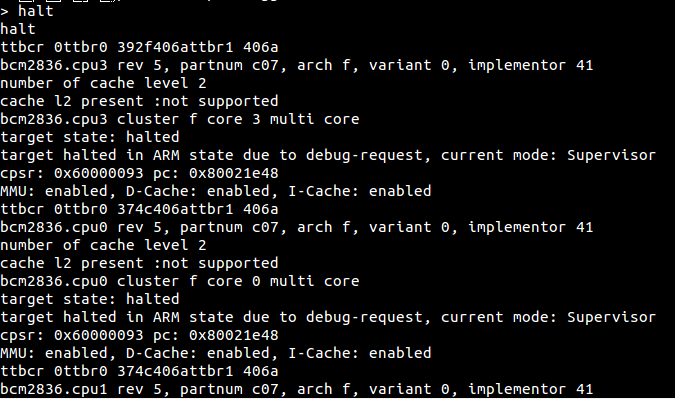 If all goes well, we should see the four cores halt, and we’re ready to debug. If you have any questions or comments, please post in the comment section below! Thanks for reading. If I were to send you two Raspberry Pi 2 – Model B boards how much would you charge to enable JTAG for me? JTAG is enabled on all the Raspberry Pi boards. The pins are on the GPIOs but need to be set to alternative function. By following the steps in this guide, you will be able to utilize JTAG. Are you having difficulty with any of my instructions that I can assist you with? I’m trying something pretty similar but in bare metal context, no OS. At boot I enable the necessary GPIO for JTAG (24, 25, 26, 27) but my debug module (RPi HUB module from FTDI) is unable to get any feedback from the PI2. The TDO line keeps always high. Doesn’t it depend on the proc mode (my PI2 boots in HYP mode) ? Or any hidden feature in the bootcode.bin program would prevent the JTAG cell to reply ? How are you enabling the GPIOs for JTAG? Do you have the proper interface configuration file for the RPi HUB and OpenOCD? JTAG is enabled on all models, all that needs to happen is for the GPIOs to be set to their proper ALT functions. Are you using OpenOCD? I want to use an Atmel Dragon programmer to download code and use the Pi as a bare- metal embedded controller. I want to bypass any operating system and boot directly to the application. In theory yes, you’ll probably need to do a soft_reset_halt in OpenOCD and clear all the registers and wipe the memory, then load your application. 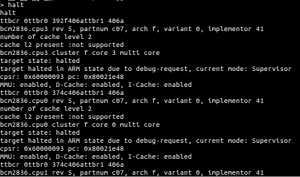 I’m not too familiar with the Atmel Dragon Programmer but if it uses standard JTAG protocol, it shouldn’t be an issue. There’s an example blink.elf somewhere on GitHub that serves as a bare-metal/GPIO example. I appreciate the friendly words, I’m hoping to have some more good content coming soon! Can we crack the video codecs with this ? I’m running a hash farm for several weeks and I have no match results yet. I thing it’ll be more straightforward, or maybe we can glitch the runtimes into borking the comm. I wonder if it is possible to configure JTAG on raspberry pi3 with raspbian on board and use it to program other devices directly from the same PI (without any additional PC with Linux or Windows). That’s absolutely possible! I could do a how-to on that if you’re interested. I am on ubuntu 17 with ft232h adapter. Info : auto-selecting first available session transport “jtag”. To override use ‘transport select ‘. It looks like the GPIO have not been set to the proper alternative function. Please be sure that during the section where you compile ‘JtagEnabler’ you go into the source code and modify the line ‘#define BCM2708_PERI_BASE	0x20000000’ to ‘#define BCM2708_PERI_BASE	0x3F000000’ (without the quotes) then compile following the rest of the directions. 0x3F000000 is for Raspberry Pi 2 and 3, where 0x20000000 is for the original Raspberry Pi. Be sure to run the JtagEnabler binary before attempting to connect to JTAG. Double check your pins are connected correctly.